Waterjet proves to be ideal tool for stripping paint, corrosion from old cast and wrought iron without causing damage at sensitive site. 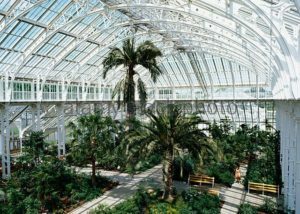 The iconic Temperate glasshouse located in the famous Royal Botanic Gardens, Kew in west London, is a vital repository for the world’s temperate plant species. It is currently undergoing a five-year restoration project which involves highly skilled ultra-high pressure waterjet blast cleaning techniques. For the past few months, specialist UHP waterjet company Aquablast Ltd, based at Beccles in Suffolk, England, has been playing an important role in the $46 million (c. £36m) restoration of the famous Temperate House. The largest surviving Victorian glasshouse adheres to strict heritage conservation laws; the building has a Grade 1 listing, demanding that repairs and restoration are carried out under intense scrutiny and with the greatest care. 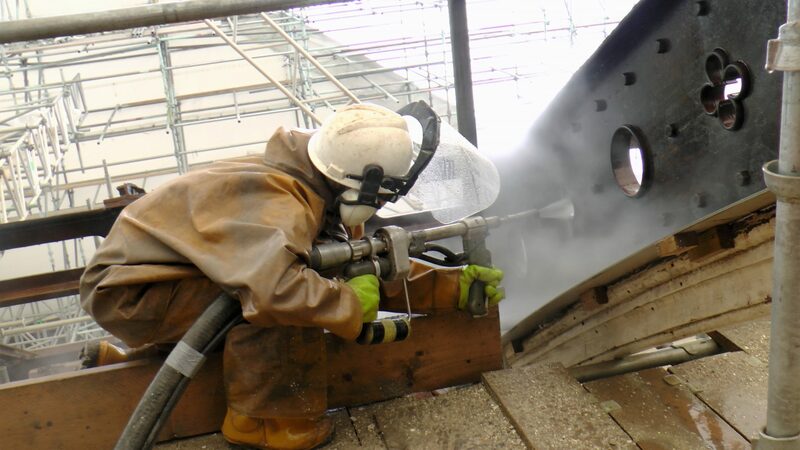 Aquablast was tasked by the project main contractor, ISG, to provide eight Jet Edge UHP waterjet lances to strip the ironwork to create an ideal anchor pattern for the new paint system, which is expected to last up to 25 years. To minimize the environmental impact of the work on Kew Gardens, 55,000 psi UHP waterjetting was chosen and four of the company’s largest Jet Edge iP55-280DS UHP waterjet pumps were brought into Kew Gardens for the project. The Temperate House iron and woodwork had been deteriorating for some time before its closure in 2013, prompting the start of the five year program to restore the building to its former splendour before re-opening in 2018. Following the safe removal of the plants to a temporary glasshouse on site, thousands of panes of glass had to be removed so that the original, mainly cast iron, frame was fully accessible to remove multiple layers of old white paint and corrosion. “This was a challenging project for us,” said Donald Blair, Aquablast’s managing director. “It’s a very complicated structure. The Jet Edge machines performed superbly. We had 10 men rotating on eight guns working 10 hours a day, six days a week, for four months on a tight schedule and we only replaced a few seals and fixed an oil leak on one of the pump’s engines. I’m pleased to say that our equipment, and our men, performed near faultlessly. A special membrane was laid in the building to collect the rust and paint arisings, but because Aquablast’s waterjet systems use no abrasives, the clean-up requirement was relatively simple. The entire Temperate House, which at 630 feet long and 62 feet high, extending to over 53,000 square feet, has been entirely encapsulated in a vast scaffolded enclosure which protects nearby plants and trees, while also allowing work to progress unaffected by weather. 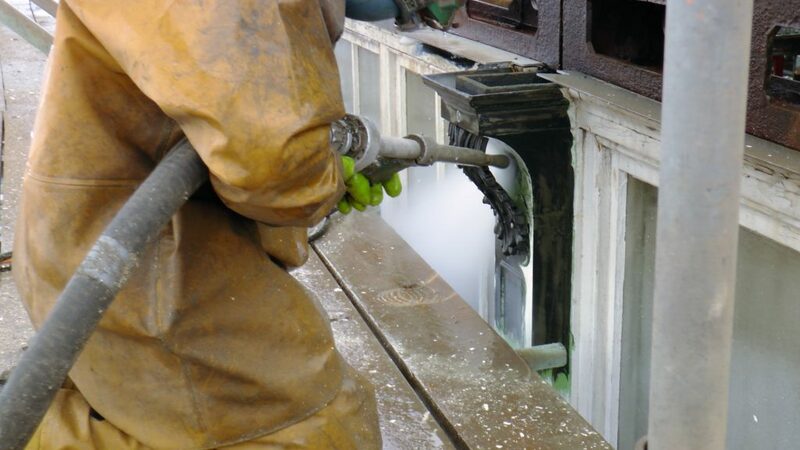 “The 55,000 psi UHP waterjet equipment and techniques employed by Aquablast worked very well for us,” explains Jeff King, ISG’s senior project manager. It doesn’t use a lot of water and it was ideal for restoring old cast and wrought iron without causing any damage. It fulfilled our environmental and health and safety objectives on this complex project on a sensitive site quite adequately. For more information about Aquablast, visit www.aquablast.co.uk, call +44 (0) 1502 714143 or e-mail sales@aquablast.co.uk. For more information about Jet Edge, visit www.jetedge.com, call +1 763-497-8700 or e-mail sales@jetedge.com. For more information on the Temperate House Restoration Project click HERE. The Royal Botanic Gardens, Kew is a world famous scientific organization, internationally respected for its outstanding collections as well as its scientific expertise in plant diversity, conservation and sustainable development in the UK and around the world. Kew Gardens is a major international and a top London visitor attraction. Kew’s 132 hectares of landscaped gardens, and Kew’s country estate, Wakehurst, attract over 1.5 million visits every year. Kew was made a UNESCO World Heritage Site in July 2003 and celebrated its 250th anniversary in 2009. Wakehurst is home to Kew’s Millennium Seed Bank, the largest wild plant seed bank in the world. Kew receives approximately just under half of its funding from government through the Department for the Environment, Food and Rural Affairs (Defra). Further funding needed to support Kew’s vital work comes from donors, membership and commercial activity including ticket sales. For more information visit www.kew.org.